You'll start speaking Spanish right from the very first day of class. The professionalism, experience and enthusiasm of our over 100 teachers is our guarantee. They are all qualified to teach Spanish with university degrees. They will all help you learn Spanish enjoyably and effectively as you are immersed in an exciting new culture. You will learn Spanish by living the language - in our classrooms, during excursions and activities and while exploring your host city. Through our years of experience, we have developed interactive and flexible Spanish teaching strategies. Thanks to our deep awareness of the cognitive process involved in learning a language, and our consideration of students' interests and aims, you'll benefit from the methodology that don Quijote has developed, tried and tested ourselves. In our courses, you will be learning Spanish the same way you learned your mother tongue - with continuous communication and practice. Our method is adapted to both the individual needs of each student as well as the specifications outlined in the Common European Framework of Reference for Languages. In our classrooms, we are committed to giving you lively, interactive classes that provide you with the linguistic competence to achieve your Spanish objectives. In order to accomplish this, we teach with a mixture of tasks, homework and activities, which are interactive, communicative, grammatical and also cultural. You will be fully immersed in Spanish culture and language! We pride ourselves on always focusing on the students needs. 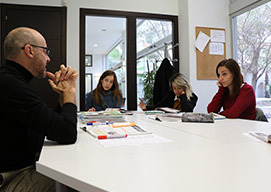 With our Intensive and Super-intensive courses especially, you learn in smaller sized groups, which allows the teacher to pay more attention to you and your progress. Develop the skills necessary to carry a basic conversation in common settings and situations, using the present, future and past tenses. Develop linguistic and communication competency to maintain conversations on general topics. Gain the language skills necessary to efficiently structure a written or oral discussion. Gain more insight into the culture and language of the Spanish-speaking world. Correct any possible mistakes and distinguish subtle linguistic nuances. Thanks to our more than 20 years of experience teaching Spanish, we have created our very own text books (and we have new ones in the making). At don Quijote, you will also get to work with support materials that are constantly updated and relevant to lessons. These will expand your knowledge of not just the Spanish language, but its culture, current affairs and society. The don Quijote study book. You'll take your placement test on your first day of classes, on Monday at 8a.m. For the times when Monday is an official holiday, courses start on Tuesdays. For complete beginners, a placement test isn't necessary, but we would still like you to come to school that day to get acquainted with the facilities. There will be at least 4 daily classes, each class is 50 minutes long, and you'll have at least a 30 minute lunch break. Classes are between 9am and 7pm. Your timetable depends on several different factors (such as your Spanish level, the existing groups, and the type of class you're taking), and will only be decided after your arrival. A certificate that confirms you have completed the course. On completion of the don Quijote course, each student receives a certificate as proof of course accomplishments, provided that you attend a minimum of 85% of your classes. The certificate describes the class you have completed: the duration, number of in-class hours, Spanish level, any specialized subjects, course goals, and additional courses. If you've attended less than 85% of classes, your certificate will show only the amount of class hours that you've attended. We can provide our course programmes and syllabi in English and/or Spanish to tutors, teachers, deans and heads of department.